Many people around the Annapolis area know Wayne Simmons. He is a local legend, or at least a minor celebrity. Like everyone else who knew him, I was stunned to hear the claim that he had made up his entire 27 year CIA career. Recently, Wayne entered into a plea agreement with Federal prosecutors and is pending sentencing on house arrest. Wayne still asserts that he is innocent. The fact that he plead guilty indicates that he does not believe he would be successful at trial. He claims the CIA disowned him. I have been investigating Wayne's case to determine just what was going on. A simple answer could be that the guy is just a fraud. Conmen aren't unusual. Although Wayne's alleged con seemed unusually detailed and over the top. Alex French, writing for the New York Times Magazine, interviewed the former CIA officer who first exposed Wayne, Kent Clizbe. Clizbe's theory was that Wayne got busted by the police on drug charges and was working as a criminal informant to avoid prosecution. This makes some sense. Criminal informants are often referred to as CIs. Is it possible that Wayne exaggerated this in his mind to equal CIA? Perhaps he was also working as a CI for federal agencies, such as the DEA, and perhaps they just told him he was doing work for the CIA? I don't know, but that does seem not just possible, but probable. In court filings, before he plead guilty, Wayne's attorney outlined some very specific things that Wayne allegedly did for the CIA. I would have no way to check most of his claims, but he does list two safe houses that he allegedly used and the years that he used them. Wayne said he used a safe house on Pierson Road in Queen Anne's County to store and distribute narcotics and guns between 1990 and 1994. I was able to track down, through property records, that the property in question was owned by a company called "Wolverine Associates". A company by the same name appears to still be in business in Potomac, MD. Do they know anything about this? Wayne also said that he used another safehouse at 1501 Overlook Drive in Silver Spring, MD, from 1979 to 1984. The owner of the property during those years was an Estonian Lutheran minister by the name of Rudolf Troost. Reverend Troost has long since passed away, so we can't ask him what, if anything, he knew about this. It is possible that Wayne just picked these addresses by random, but that strikes me as unlikely. I would really love to know what was going on at those locations. Wayne's story is an interesting one. His father was a war hero. Just about everyone in his family has served in the military and/or government. I talked with Alex French about this case as he was writing his article. 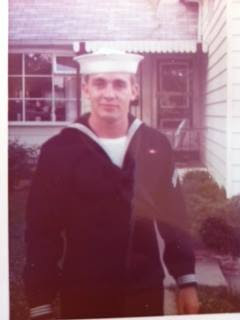 One of the interesting things I learned was that Wayne had joined the Navy, but received an honorable medicine discharge after 27 days for post concussion syndrome. Of course, most people would think that there was nothing wrong with receiving this type of discharge. But could it be that Wayne viewed this as a personal failing and a disgrace to his family? Was he obsessed with the number 27 and then turned that, in his Walter Mitty mind, to a 27 year career with the CIA to redeem himself in they eyes of his family, if not in his own eyes? I don't know if we will ever know the full truth about just what Wayne was doing or why he was doing it. Wayne will be sentenced on July 15, 2016, in Federal Court in Alexandria, Virginia. Perhaps we will find out more then. Airport Specials? Enough to set Wayne into action. 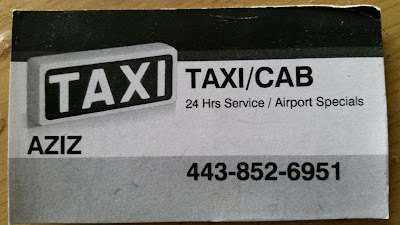 Side notes: I happened to meet the taxi driver who Wayne beat up in 2007. He was driving for Uber. Alex French emailed me the police report (email me, btw if you want a copy - bill at williamcooke dot com) so I knew the victim's name. I asked the driver about the incident. He remembered it and we both talked about the incident and Wayne's recent arrest. He found the whole situation very strange, but also humorous. Just to make sure I really had the right guy, I asked him for his business card. The number on it matched the cell phone number he gave in the police report. Call him if you need a ride around Anne Arundel County. He would appreciate it if you didn't assault him. A few months prior, I was on another Uber ride and was talking to the driver who said he had worked as a private contractor in Afghanistan. I asked him if he knew Wayne. He smiled and said he did. He ran into him in Afghanistan on a helicopter. According to the driver, everyone called Wayne "the celebrity" because he had appeared on Fox News so many times. Wayne loved when people knew he was. 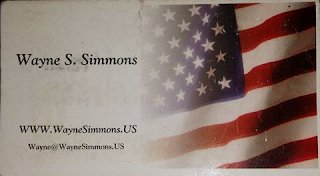 Recently, I ran across someone else who knew Wayne who still had his business card. Lots of people have seen my blog posts about this topic and have been happy to volunteer information that they have regarding Wayne. One person who knew Wayne in the 1980s said he was a "big coke dealer" in Prince George's County back then. He also ran, according to this person, halfway houses for men with AIDS, not out of any humanitarian concern, but because "it paid good money." Another person at a bar told me that he punched her then boyfriend in the face for no reason, other than he wanted to talk to her.